Admire the abundance of native wildlife as it emerges after sunset. Observe large mobs of kangaroos, isolated wombats, predatory owls, feral foxes and rabbits under starlit skies as you explore the old Sunnydale Station property. These tours are exciting as well as informative as you can identify the animals from their reflective eyes shining in our bright spotlights. Tour are taken in an open wagon so no walking is involved - blankets are even provided on the cold nights! This tour can be enjoyed by adults and children and is worth doing just to experience the myriad of stars in the clear night sky. The cost of your tour is payable to Unforgettable Houseboats and can be paid by Visa, MasterCard or direct deposit. An invoice will be issued for this tour option when booking. All tours need to be pre-booked at least 4 weeks prior to boarding. 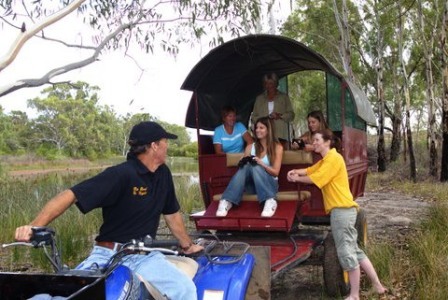 Please contact Unforgettable Houseboats to arrange your itinerary and book your tour. * Please note all prices are subject to change without notice.